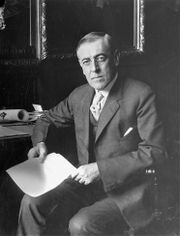 Woodrow Wilson (D), one of the founders of the progressives in America, and definitely in the top few worst Presidents. Wilson was a Democrat and progressive: meaning he was an unabashed racist. Today, that's about selective preferences for minorities against whites or Asians - but back in his day, it was about White Supremacy. Famous for playing The Birth of a Nation in the White House (a very racist film) and then celebrating it's greatness, and re-popularizing the KKK. The first rule of Democrats is they don't win if they tell the truth, so (1916) Wilson re-ran on “He Kept Us Out of War.”, all while he was planning on how to get us into it. . The second rule of Democrats is once they get power, they will abuse it. So Wilson worked with congress to pass the Espionage Act: giving himself extraordinary power to abuse Americans who opposed him or the war. Remember "Fire in a crowded theater"? Too few remember the context: Justice Oliver Wendell Holmes, Jr., invented that line to uphold the illegal persecution of an immigrant who was passing out anti-WWI fliers under this Espionage Act (in Schenck v. United States). They parrot the line, without being taught or understanding that it's premise was invented to abuse minority immigrants for opposing war. Jingoism was in the 1918 midterms, Wilson urged voters to support Democrats, “for the sake of the nation itself” because Republicans were trying to take “the conduct of the war out of my hands.” And they might get us out of WWI. It backfired and he lost control of both Houses. He created the League of Nations (ineptly), and the failure of that institution contributed to, or was one of the contributing causes to the rise of Hitler and WWII. It was also one of the reason why FDR had such problems getting us into WWII, because the nation didn't want another Wilson: they got worst with FDR when it came to war. This page was last edited on 4 April 2019, at 04:19.